In 1865, English author Charles Lutwidge Dodgson wrote the tale of a girl who falls down a rabbit whole and lands in a fantasy world. 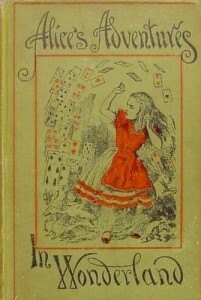 That book was Alice’s Adventures in Wonderland, and Dodgson wrote it under the pseudonymn Lewis Carroll. Considered one of the best works of literary nonsense, the book has influenced more than 20 films and adaptations since. From 1903 to 1915, three silent films about Alice’s adventures were released. The film wasn’t without its critics. Many Carroll fans and critics accused Disney of “Americanizing” one of English literature’s greatest works. Disney’s version – which was intended for families rather than great recognition (although it was nominated for Best Scoring of a Musical Picture) – did not experience a stellar response upon initial release. It earned just $2.4 million at the US box office. In 1954, an edited version aired as an episode of Disneyland (ABC). At that point, even Disney himself felt the film failed because Alice had no “heart”. It would take two decades before Alice in Wonderland would enjoy some level of financial success as the feature became associated with the drug culture. Along with Fantasia and The Three Caballeros, the film was shown in college towns across the country. In response, Disney resisted drug-related notions and withdrew the film from universities. In 1974, Disney re-released Alice in Wonderland theatrically, promoting it with Jefferson Airplane’s White Rabbit. Four years later the film was re-shown in the UK, then again in the US in 1981. That same year, Disney opted to make Alice in Wonderland one of the first titles available on home video. In 2010, Disney released a new version of the story, directed by Tim Burton and starring Johnny Depp and Mia Wasikowska. The computer-animated and live action film. The work enjoyed tremendous success, and also rekindled people’s appreciation for the earlier version. Today, Disney’s 1951 Alice in Wonderland is considered an American classic, and Alice’s popularity as a Disney character continues to grow. Many view the original animated film as a work for adults as much as children due to its multi-faceted appeal. What was your first encounter with Alice and her fantastic adventures?